Smooth Edges? Compare ours to others and see the difference. Easy closing? No comparison here–ours just plain closes easier. Period. 180° opening? No other manufacturer can even come close to us. Irregular parting lines or techniques? 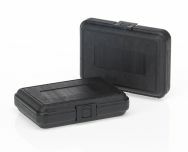 A piece of cake for Blow Molded Products. 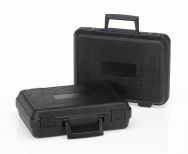 Califoam Blow Molded Products cases are durable, attractive, reusable, versatile, recyclable and affordable. 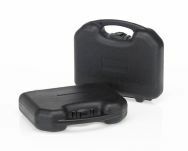 Manufactured using high density polyethylene plastic, the double wall construction offers unbeatable product protection. 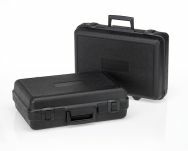 Califoam Blow Molded Products carrying cases are lightweight, compact, will not rust– and are chemical resistant. 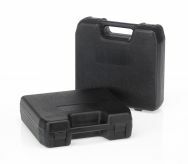 A Califoam Blow Molded Products case is sure to add value to your product and added product identity. All this at a price that can't be beat! Stock Cases: in stock for immediate delivery, with no minimum order required. Choose from black (custom colors available), with blank recess label inserts and open interior design, to use as is–or with foam inserts. Semi-Custom: Califoam Blow Molded Products will design and build relatively inexpensive mold cores using our existing mold exteriors, free of charge. This low cost option allows our customers to mold interiors that custom fit their components, providing superior product protection, attractive display and greater space efficiency. Semi-Custom applications open up a world of options, adding even further product identity and uniqueness such as: Custom colors, engraved logos, literature slots, windows and snap fits, to name a few. Custom: The ultimate in custom packaging and long the specialty of Califoam Blow Molded Products. 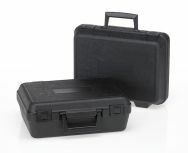 Our team of expert engineers will design a custom case around your components. This design latitude ensures that we meet your exacting specifications, while providing existing and unique styling and performance. 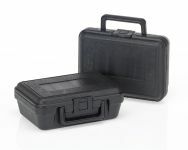 A BMP custom case is sure to boost your product sales and establish total product identity. Our experts are standing by with a FREE consultation to help you determine which case is best for your application! We would be happy to send you a free sample. Call Califoam Products for Special Deals.